When Wausau Paper Mills Co. Jay ME suffered repeated failures of the original bronze bearings furnished with the equipment, the maintenance staff switched to graphite-metal alloy bearings. The move was made to GRAPHALLOY self-lubricating bushings designed specifically to withstand the intermittent dry-run conditions of the paper mill’s stock tank agitators, where varying stock levels sometimes eliminate all lubrication. The mill uses 15 pulp stock agitators to produce manufacturing papers and labels. Each unit has a horizontal shaft driving a 54 inch, 4 blade shockless propeller made of stainless steel. The original bushings were made of bronze and had graphite plugs that were expected to provide self lubricating properties. One of the GRAPHALLOY Bushings was installed in January 1996. During the plant’s July shut down, this bushing was inspected and showed no wear. 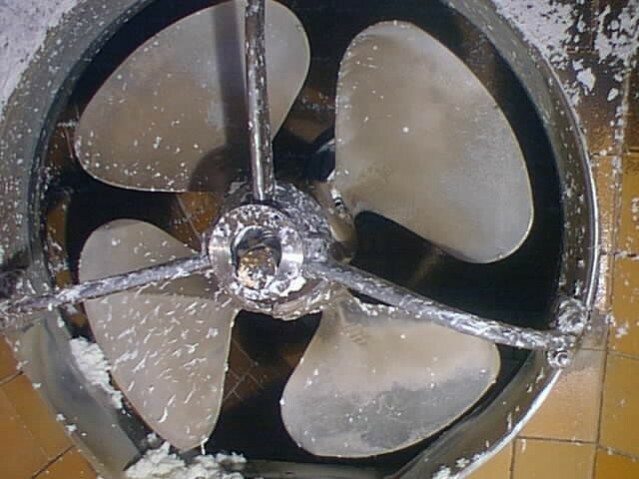 At the January 1997 inspection, again the bushing showed no wear. In February 1997, eight additional GRAPHALLOY bushings were ordered and the new bushings were installed on all remaining agitators. As of January 1998, the bushings were still operating well and no measurable wear was apparent on those installed 18 and 24 months prior.